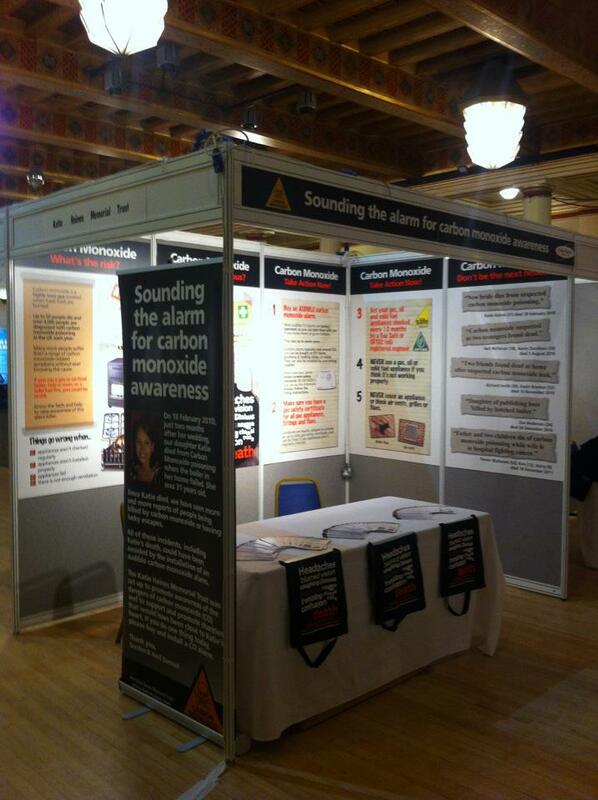 KHMT took a three-day stand at the NUS (National Union of Students) Annual Conference at Sheffield City Hall for the Trust’s first carbon monoxide awareness project. We are grateful to Katie’s friend Mat Rumbelow who designed the stand and helped man it and to Honeywell Analytics, who provided CO detectors at a minimal cost for students. Students are a vulnerable sector, particularly during the second year when they leave their Halls of Residence and move into private accommodation. There is a need to make sure that landlords have their carbon burning appliances regularly serviced and a Gas Safety Certificate provided for gas appliances. We wanted to encourage students to protect themselves by buying an audible CO Alarm. These alarms are the same size as a smoke alarm so fully portable to take when travelling abroad.